GEMCO is one leader manufacturer and supplier of coal briquetting press in China, if you want to buy the best coal briquetting equipment in the world, GEMCO is the right choice. 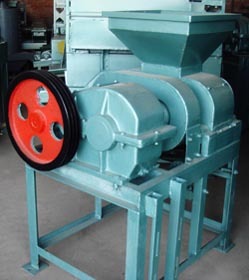 Because Coal briquetting press has become one strong link of the power generation production chain, and in China coal-fired power generation plant provide 70% of the electricity of the whole consumption. Carbonization Process: Use a low temperature inner heated(450℃) fluidized bed carbonization stove to produce smokeless semi-coke coal containing about 20% of the volatile. The carbonization stove structure is very simple, with no multiple hole board and blender part, it’s very easy to operate and maintain. Blend the smokeless semi-coke coal with slaked lime (desulfurization agent), clay (auxiliary forming agent) and coking additives. After being well stirred, the mixture would go through the coal briquetting press, with the normal temperature and the mechanic pressure of about 300-500 kg/cm2, the fine carbonized coal briquettes are produced, then it’s the last progress: drying and packaging. Special tip: the smokeless semi-coke coal is easy to kindle, the drying temperature shall be controlled within a low range.